ECO-FRIENDY FABRIC: 100% Cotton - Enjoy the comfort of this classic style nightgown made from our premium 100% cotton lawn fabric. All of our cotton is pre-shrunk so that you never have to worry about your garment shrinking in the wash. ELEGANT DESIGN: Calls back to a simpler time to give your nighttime wardrobe a little extra character. 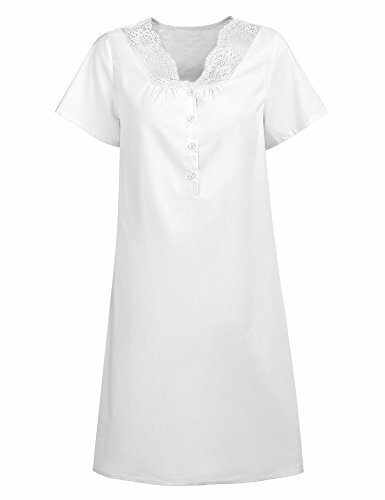 Add a touch of elegance to your nighttime routine in this super soft 100% cotton lawn nightgown. GREAT AS A GIFT - A nightgown is one of those warm familiar timeless products that is always appreciated as a gift - which is why it makes the perfect present for your mom, wife, sister, or friend. While few people may think to buy sleepwear for themselves, everyone uses them on a daily basis. Give this nightgown as a thoughtful gift for your loved one's next birthday or for Christmas. S---Shoulder 15.5"--- Sleeve 7.7" ---Bust 19.1" --- Length 36.4"
M---Shoulder 15.9"--- Sleeve 7.9" ---Bust 20.1" --- Length 37.0"
L---Shoulder 16.4"--- Sleeve 8.1" ---Bust 21.1" --- Length 37.6"
XL---Shoulder 16.9"--- Sleeve 8.3" ---Bust 22.0" --- Length 38.2"
XXL---Shoulder 17.4"--- Sleeve 8.5" ---Bust 23.0" --- Length 39.2"
You come to the right store, we always provide the unique design Nightgown.